CA: President Mnangagwa, welcome to the show. Thanks for joining me. ED: Thank you, thank you. CA: So here you are in the United States at the UN General Assembly. It’s your maiden speech. And it’s no secret that the world had a very, very negative impression of Zimbabwe for many, many years. President Mugabe seemed to stay in power forever and now here you are. What is it that you want to tell the world from the pulpit of the UN? ED: Well, the first point is that there is a new administration of the Second Republic of Zimbabwe, which I lead. We have just completed harmonised general elections in July this year. So this time around, after many years of Independence and several elections, this is the only time we as Zimbabweans had democratic space for everyone, to exercise their rights. This is the only time in our history since Independence in 1980 that we had more – we usually had about five political parties contesting elections, this time around, because of the democratic political space which we created, we had 133 political parties; and of those 133 political parties, 56 contested the elections. CA: So you’re talking about a much more pluralistic Zimbabwe. You say that it’s a new day, a new team, and a new democracy. What do you say to the people of Zimbabwe and the people who are observing around the world about whether you can be a unifier? Obviously, your election victory was very, very narrow, it was less than one percent and people have complained about it; people have said, you know, they hope you won’t be divisive, and be just for the Zanu-PF voters. Let me tell you what the United States has said about the post-election situation. The State Department in August said, “The United States government is greatly concerned by credible reports of numerous detentions, beatings and other abuses of Zimbabweans over the past week, particularly targeting opposition activists.” That is the new Zimbabwe? ED: I can assure you that this time around we had a very peaceful, free, fair election, which we have never experienced before. I am happy that that culture is taking root. I believe that we should do everything possible under this administration to cultivate that culture, to make sure our people develop a culture of accepting opposing views within the community. And I am happy that during the entire process, the electoral process, we didn’t have any disturbances. All the political parties accessed voters whom they thought would support them. The only event which is regrettable is the one which happened two days after the elections. We regret that event and we are doing everything possible… Just before I came here I appointed a commission of inquiry to deal with that. I felt that it would not be proper for ourselves to investigate ourselves, which is why we have an outside inquiry. But besides, my message from the day I took over on the 24th of November last year is peace, peace, unity, unity and love among our people. Yes, indeed, in terms of our constitution and the terms of Commonwealth parliamentary democracy, it is first-past-the-post. I had 50,6 percent. My nearest contender had 44, I think. In terms of our Constitution, I won the elections, although the victory is very narrow as you say (chuckles). I hope that as we go forward and as we open up Zimbabwe … people can understand that we can do better. But if the opposition are going to have a better message than us, then the next election someone else (will win). CA: The opposition, you say, they have a better message…? ED: If the people think the other political parties have a better message than my political party they will obviously vote for the party that has the better message. 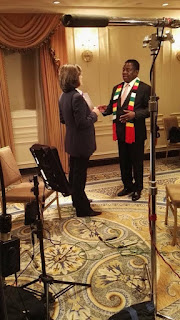 CA: So, Mr President, you have a pretty big task because you say all these things and you also were part of the old regime, right, the Mugabe regime, for all those years from the liberation struggle until you took over. And many people are asking, I think legitimately, is this really a new Government? Is it really a new dawn? Or is it a lot of the old guard now taking on a new role? Some people will describe is as old wine in new bottles. ED: If you look at me, then you would say I belong to the old guard, and that is a fact. But look at my Cabinet, look at the new Cabinet which I have. How many people are new in that Cabinet? You can see the direction which we are going. And I said this before the conclusion of the elections: that I’m going to bring in new people with expertise in various areas, women and youth. And I have done so. So I believe that people should examine what I am doing and not live on perceptions. I believe that the past should be left behind and we do our best for the future and work for the betterment of our people. To do so, in my view, I need the best brains the country can produce across the board. CA: So in that case are you asking for many expatriates to come back, whether they are black or white? Because you know it was a very difficult situation for many in Zimbabwe, but especially for whites. President Mugabe said many things about them and they were, you know, burnt out or run out of their farms and homes and country. You have appointed a commission to try and attract them back. Is it going to be a friendly place for white Zimbabweans? ED: I can assure you that under my administration, the issue of colour has no place. It is the issue of expertise which we want. We want to grow our economy, we want to modernise our economy, we want to industrialise our economy. Expertise can reside in whatever colour. And fortunately, our people in Zimbabwe, they reason above that. We have a huge white population; Indian, white, other groups, they’re there. We are a family. So we have no problem with that at all. CA: You may not think it is about colour but it is about reconciliation, and I’m interested – you did just say you want to forget about the past and move forward. I guess I just want to ask you, President Mugabe was accused of many violations of human rights, of corruption, of all sorts of violations and abuses. Would a Mnangagwa administration hold the former President accountable in any kind of way, in a court, in a truth and reconciliation kind of way? Is that on the agenda? ED: We cannot put an agenda on a person. We put an agenda to make sure all those involved in corruption account for (the) corruption they committed. We have a Zimbabwe Anti-Corruption Commission. I have strengthened that one, which is indicative of my desire to deal with corruption. And so many cases are being prosecuted, if you are following, of prominent persons who have been affected by the drive we are having now against corruption. But, indeed, we will not, as the new administration, focus on the past. We need to focus, because we are going to live in the future, we will never live in the past again. Yes, we regret whatever happened in the past. And I have a National Peace and Reconciliation Commission dealing with things that happened in the past. My administration, our focus is to make Zimbabwe a better place; is to make Zimbabwe acceptable again in the international community. We must embrace. We are re-engaging and engaging nations and international organisations to be accepted. And we must remove any pieces of legislation which will be constraints in the areas of political reform. We are determined to move forward and be a member of the international community again, embraced by all societies in the family of nations. CA: … and he said I will never leave at the hand of imperialists, and he was furious at the idea of leaving. 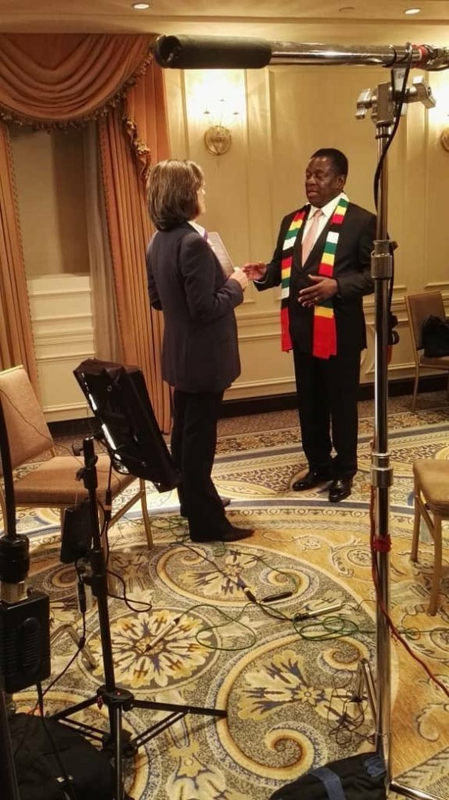 I’m going to play a sound bite, and he was saying I will not leave power, this is about regime change, we will dig in, we will remain in our trenches. So in retrospect, Mr President, now that you are the President, was it regrettable that President Mugabe didn’t leave legitimately and under elections a long, long time ago? ED: I will abide by that without any iota of resistance at all. Even if the people love me, I will still go away because I believe constitutionalism is important. In fact, we must give people the chance to have other leaders. Ten years is not a short period. In my view, it’s quite a long period; and if you have a vision, a period long enough to implement your vision. CA: Clearly you have a vision, a desire, to move Zimbabwe away from the past. But let’s face it, you are part of the old regime, you were President Mugabe’s intelligence chief, you did take part in the suppression of the elections in 2008, when Morgan Tsvangirai actually won the parliamentary vote and actually they believe they won the first round of the Presidential election. Again, do you regret that? And I ask you this because upon Morgan Tsvangirai’s death not so long ago, you said something very important about it. You said, both in and after the Government of National Unity, he remained a national figure who obdurately insisted on free, fair and credible non-violent elections as a way of strengthening our democracy. Those were your words. CA: (Interjecting) It was considered a bit of a stitch up. Do you regret it? ED: The voters themselves did not make Tsvangirai get 50 percent-plus-one. I regret that (the President at that) time did not achieve 50 percent-plus-one in that election. But, again, I do not feel it is necessary anymore for people to dwell on the past. Let us look into the future. Let us – all of us – collectively as a people under one flag, under one national anthem, under the guidance of our new Constitution, move forward and improve the economic environment so that we attract global capital to our country. For the past two decades we have been an isolated island (inaudible) … Let us have this change. ED: (laughing) You have mentioned it. ED: (laughing) He calls me ED. CA: And what is “ED”? CA: (Interjecting) And he doesn’t say Mr President to you? ED: Officially, when he writes letters, he addresses me as “President”. He calls me that, formally. CA: Because I read that you tried to restrain some of his excesses, some of his impulses. He wanted to go with a big plane, with a 38-person entourage, for his medical check in Singapore. And you had to try to clip those wings. Was that difficult for you? What did you say to him? ED: No. I followed the Statutory Instrument which provides for the issues of a former President. It states how many security (personnel), how many staff, and how many times he will be able to go out per year. So it indeed is correct that initially he wanted the same level as before, then I informed him that this is not the correct (position) anymore. My predecessor is a lawyer, like myself … And he accepted it. CA: What did you say? CA: How did they save you? What was the process? ED; Yes. So they said the level of poisoning was very high, something like 31 percent. It was reduced in six days down to 11 percent. And I had something like three to four hours of life (had I not been rushed to South Africa). I would have died of cardiac failure. The research which was done by various doctors in South Africa, in Australia and some other places, Europe, I think, where the tests were done, called it metal poisoning, arsenic metal poisoning. And they narrowed it as to where it could have come from … Well, the speculation as to who administered it … Well, I’m back now. The level of poisoning, my last review says the level of poisoning in my system now is under three percent. CA: Well that’s good news for you, but do you think you still face a threat from, they call her Gucci Grace, Mrs Mugabe? ED: Well, on the 23rd of June I escaped another assassination attempt. But, again, I don’t say it is from Mrs Mugabe. That’s the duty of security services and the intelligence services. CA: Have you said anything to your predecessor, Robert Mugabe, about this, to keep his wife under control? ED: If I did that it would mean I have something against her, or some evidence against her. I don’t have evidence against her, the former First Lady. I like the legal process to take place, let the security handle it… Whatever the outcome (of the investigations). At the end of the day, I’m alive. ED: Well, if you have the time I can explain how it comes about. CA: Are you The Crocodile? ED: No, I’m human. (Laughter). In 1964, when we had come from Nanking, China, where I had done my military training, our leader then, the late Reverend Ndabaningi Sithole, deployed us. And he named my group “Crocodile”. None of my colleagues are around, they passed on. So during the entire process of the liberation struggle in Zimbabwe, my colleagues referred to me as Crocodile. But my totem is Lion. So this is how it is. Let me assure you, I’m as soft as wool. But I have the traits of being patient like a crocodile. CA: What about the traits of the lion? ED: That depends, being calculative, and also hunting. CA: So I want to ask you, you mentioned the liberation struggle, in the spirit of truth and reconciliation. Obviously, there was a massacre in Matabeleland during the 1980s, and you know, there were descriptions of what was being described as North Korean-trained Zimbabwean forces killing some 20 000 people. Again, is that something that you would consider a formal, national apology for? ED: At the time that happened, my predecessor said it was a moment of madness, that’s what he said, which is a result of what was happening internally. But when I took over, I felt that we needed to have finality on this issue. So I appointed a Peace and National Reconciliation Commission, which is now eight months into investigations and gathering evidence. And whatever report they are going to make, I’ve promised the nation that I will make it public. CA: And if it’s the worst of the worst, will you apologise? ED: Exactly. It will be on the basis of that report and the recommendations of that report. We should be man enough as a Government to accept whatever recommendations are made and see how, as a Government, we comply with the recommendations of the report. What I will not want to do is, in advance, say I will do this, I will do that. We will act according to the report. CA: President Emmerson Mnangagwa, thank you very much.